WinStar Online Casino is a brand new top-quality online casino, launched in September 2018. This brand is the European online branch of the US landbased WinStar Casino so players can expect a great gambling experience to say the least. WinStar Online Casino is fully supported across all digital devices and operating systems. The gaming platform that WinStar Online Casino is using is the GameAccount Network which is powered by the best games from an impressive list of game vendors including NetEnt, IGT, Isoftbet, Betgames.tv and Scientific Games. The combination of casino providers ensure any type of player to enjoy the best and most popular online casino games whether you would prefer to play video slots, jackpot games, video poker games, card/table games, instant win games or live dealer games (provided by NetEnt Live and Betgames.tv). WinStar Online Casino is a smart, modern and great looking website in a purple colour tone. As mentioned above, it’s supported on all digital devices and no download is required to play the games. The game lobby is sorted by the different game types but you can also filter the lobby by new games and quickly locate the latest game releases or use the search function to locate your favourite game by enter the game title. The customer support at WinStar Online Casino is available Monday to Friday between 8.30am-9pm and between 9.30am-1pm and 2pm-6pm on weekends and bank holidays. They can be reached by phone (+44 (0)203 582 6986), e-mail or by using the live chat function which can be found all over the website. There’s also a FAQ page available where you can find most information regarding your account, bonuses and other things that might be useful. WinStar Online Casino is operated by GAN PLC which is a company registered in the UK (company number 03883658). They are licensed by the UK Gambling Commission and the Alderney Gambling Control Commission. WinStar Online Casino meets the highest standards of responsible gaming policies, player safety and security. 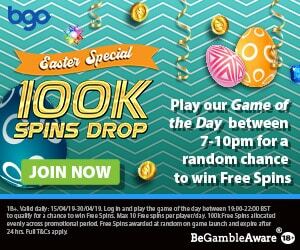 WinStar Online Casino: Get a Welcome Bonus Package worth up to £/€250 + 100 Spins! Click here and join WinStar Online Casino and get up to £/€250 + 100 Bonus Spins! Players who made their first deposit will get 10 Bonus Spins every day throughout December. So you can get up to 310 bonus spins! The Bonus Spins can be used on one of the following video slots Gonzo’s Quest, Starburst, Fruit Shop Xmas, Flowers Xmas, Jingle Spins or Secrets of Christmas. More Casino Promotions at WinStar Online Casino! WinStar Online Casino offer different casino promotions from time to time. These include re-load bonuses on specific games where you will receive a certain amount of bonuses if you bet a certain amount on the game in question. Other promos are available so make sure you keep on eye on your inbox so you don’t miss out on some extra bonuses on new game releases, weekends/holiday and other events. WinStar Online Casino accepts all major payment methods such as credit/debit cards, direct bank transfers, e-wallets (deposits made by e-wallets does not qualify for the first deposit bonus) and other regional banking solutions. All transactions and other stored information is secured by the most advanced encryption technology. Popular Online Video Slots at WinStar Online Casino! WinStar Online Casino offer a great collection of video slots which are provided by some of the best game developers in online gaming such as NetEnt, IGT, ISoftBet, Scientific Games and more. Some of the most popular video slots at the moment are Starburst, Rambo, BerryBurst, Finn and the Swirly Spin, Rainbow Riches, Red Dragon Wild, Asgardian Stones, Wild Wild West, Jumanji and Planet of the Apes.